NEW! Camber Adjusters for 8mm King Pins! We know these are super-difficult to get, and we've answered your call! 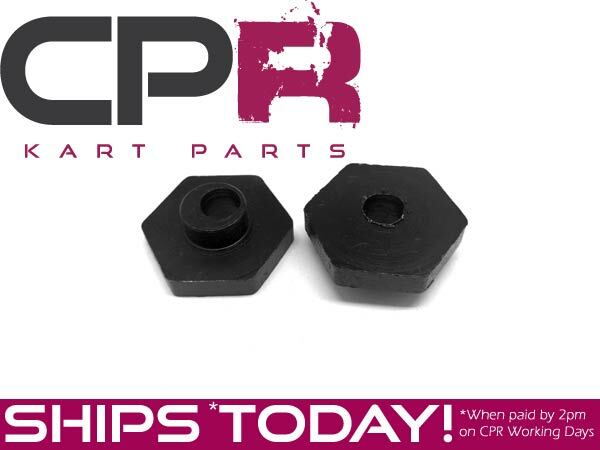 New and in-stock ready to ship are our Genuine CPR Camber/Castor adjusters with hex adjustment. FIX OUT OF ALIGNMENT STEERING! Our new hex adjuster nuts are designed to correct and adjust Camber and Castor on your kart - even if your kart didn't come with adjustment from factory! Using a 30mm socket or a shifter, all you need to do to adjust your camber and caster is to slighitly loosen your king pin and rotate the hex adjusters, then re-tighten and race! If you want to get your hands on one today, we've got them in stock and ready to ship! BRAND NEW Pair of Genuine CPR Camber Adjustment locks designed for our CHBC01 chassis. To suit frames with 14mm top hole and 8mm King Pins.